Another beautiful list. Thanks for sharing. I am so excited for you to have your "new to you home" be all that you invision it to be. Lovely post as always. - The rain has started here in our area of the PNW as well. - I enjoy it for the most part although the cooler temps are taking a bit to adjust to. 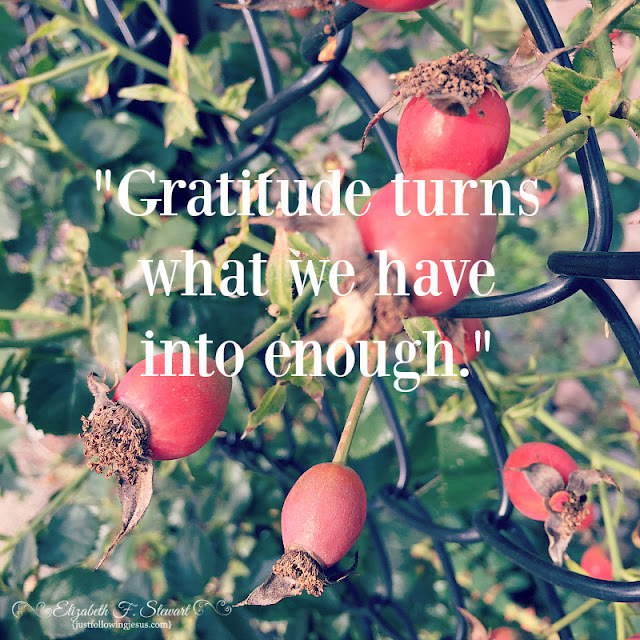 - Such a great list of things to be grateful for. My Inspiration photo for today says almost the same thing as your 1st photo. - Loved your Grandson riding the dog, so cute. Where do you live, Ida? I didn't know you were a PNW gal, too! Beautiful list, Elizabeth - God sends us such beautiful gifts - that red blanket sounds just perfect for my rainy Tennessee day! I was very excited to find a red cotton quilt to fold up on the end of our bed! I nearly missed this! Yay for beautiful gifts and another week to be grateful! We had pot roast this week, too. ;) A boy and his dog. What could be more perfect than that? So many blessings! That mantle sounds intriguing - I hope you will share :) We had rain last week, thankfully. Maybe more coming on Friday. The land in south TX is soaking it in and springing back to life! Have a blessed week, Elizabeth! Catching up, as usual. My computer didn't want to let me into your site for some reason. I'm here and enjoying the blessings you enjoy. Can't wait to see how things have come together in your new home - and I'm just a teeny bit jealous of the Sunday nap!